S.S. City of Paris left Madeira 9 April 1884 and arrived in Honolulu on 13 Jun 1884. 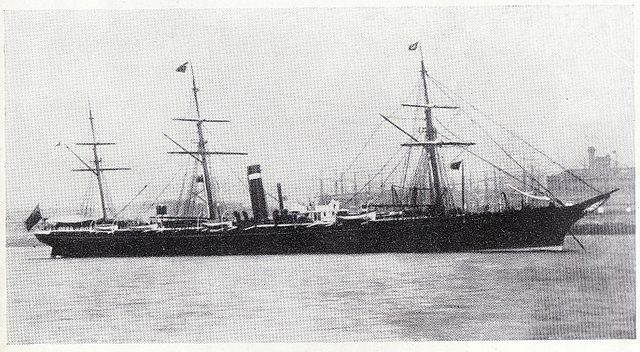 The steamship, City of Paris, under the command of Captain George Lockhead, left the island of Madeira, on April 9, 1884, at 9:20 p.m. with 556 Portuguese immigrants, arriving at St. Michael at 7:30 p.m. on April 15th. Passed Cape Albrelhos April 27 at 9 p.m., entered the Straits of Magellan at 9 a.m., cleared the Straits of Magellan on May 19, at 8 p.m. Moderate breeze and foggy weather to Coronal, which was reached on May 22 at 8 p.m. Leaving Coronal, fine weather and moderate breeze to Hawaii, which was sighted at 7 a.m. on June 12, 1884. Thence, light breezes and fair weather to arrival at Honolulu at 8 a.m. on June 13, 1884. The immigrants who landed from the “City of Paris” on Sunday, are the first class of immigrants that have come to the islands. They wore their good clothes, that presented quite a different appearance from the poorly-dressed, travel worn lot that we saw on the steamer the day of her arrival. The vessel took 65 days to make the trip from Madeira. There were 10 births and 60 deaths, and a total of 863 landed in the port of Honolulu June 13, 1884. As the editor of the Planters Monthly, and by some prominent white members of the Legislature have expressed their opinion that the importation of Portuguese should be discontinued. The public is in danger of being misled into the belief of the planters, are of the same opinion. I am very certain that the majority of the planters are not, and that they would regard a suspension of Portuguese immigrants as a grave misfortune. Planting operations, though in the main profitable have been for years past sadly impeded by the scarcity and uncertainty of the labor supply. The uncertainty has been mainly caused by the disjointed and spasmodic arrogance of the Gov’t in regard to immigration. One year we are led to expect a permanent supply from the South Sea Islands. A few people came, thence, and as soon as we had gotten into the way of working them, the scheme was abandoned. Then comes the Chinese in shiploads. Wages go down and our spirits rise. Immediately, however, the further introduction of celestials is tabooed. Up goes the wages again, and we are once more dejected. The Portuguese immigrants set in. We are promised thousands of them, but as we have overcome the difficulties always to be encountered on the introduction of a new nationality, the Gov’t concludes they are too expensive and the supply is interrupted. Then came the Dutchmen from Bremen, eager for any kind of laborers, we received them with open arms. Alas, our hair began to turn gray! We are on a verge of a lunatic asylum when relief arrives in a resumption of the Portuguese immigration on more favorable terms than before. Now we are promised Japanese, and we are glad to welcome a class of the immediate return for his money. But why should the Portuguese be discontinued? Portuguese laborers appear to be very expensive. Nevertheless, it is a fact the only really useful work that has hitherto been done in the very way of populating the country has been this very immigration of Portuguese. The planter who looks forward into the future must recognize that one of the best sources of supply for laborers wanted in years to come, is the rising generation of Portuguese. Around the base of Punchbowl is to be found a colony of Portuguese, who naturally draw together in this strange land, and there they distinguish themselves by the neatness of their dwellings, and the growth of pretty flowers and a general air of thrift which is lacking on the part of their neighbors. Thank you to Sandy Sakai of the PGHSH for this contribution. For more articles about the arrival of the SS City of Paris, please visit these search results at the Chronicling America website.